Tuesday was a busy night in the NHL with a few surprising results. The Florida Panthers beat the Montreal Canadiens in overtime and in the process made Carey Price look like an average goaltender. The Calgary Flames won a squeaker and the Winnipeg Jets manhandled the hot Chicago Blackhawks. Wednesday, there are two games in the NHL. As a result, there aren’t a lot of choices for fantasy owners. I’ll try to help navigate you through the few players available and perhaps give you some insight into who is worth taking from the small list of fantasy options. If you went with Toronto, you did well. James Van Riemsdyk, Tyler Bozak and Mitch Marner were fantasy kings as the Maple Leafs downed the Nashville Predators 6-2. Most of my choices didn’t pan out well, but Adam Henrique finally got a goal, scoring the game winner against the Dallas Stars. He’s the most expensive center available, but he exceeds every other center in projected fantasy points per game by a wide margin. The next closest player to Crosby (who projects at 5.0 PPG) is Evgeni Malkin at 4.1. You can’t really go wrong with Crosby. Only against the Edmonton Oilers on Nov. 8 did he not crush it for fantasy owners. Taking one expensive center means taking a more value friendly center in return, but Martinook is a good option either way. He’s projected at 2.8 fantasy points per game, has three points in his last three games and is going up against a Calgary team, who while they won last night, is heading home from a road trip, playing a back-to-back and still among the NHL’s worst at goals and shots against. Again, I want to take advantage of a weaker defensive match-up and Vrbata has five points in his last four games. He also 18 shots on net in that time span. 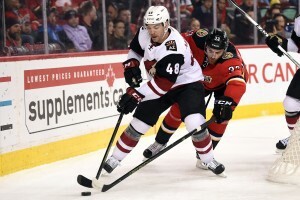 He now has 11 points in 14 games and looks rejuvenated in Arizona. He’s projected at about 3.5 fantasy points per game, but in his last three, he’s reached 5.0 points and 6.0 points twice. Kunitz is having a somewhat underwhelming season for point production thus far, but for fantasy owners, he’s often coming through at key times. Against the Maple Leafs on Saturday he potted his second game-winning goal in four games. He also put up seven shots to far exceed his point projection and price tag. He’s not scored a lot of goals but if you score on hits, penalty minutes, shots and other side points, he’s not a bad take for your fantasy team. He’s got two points in his last two games, five shots on goal, five blocks and continues to be a strong cross-over point producer for fantasy owners. Pittsburgh is a strong team offensively, but they allow a lot of shots and goals against. For Niskanen, a player who has seven points in 14 games, this could be a good combination that works in his favor. With very few truly gifted offensive defensemen playing on Wednesday, Letang is the closest thing with nine points in 10 games. He has three points in his last two contests, seven shots on goal and three blocked shots. Phillip Grubauer got the start on Tuesday which means Holtby get the nod on Wednesday. He’s easily the better of Washington’s two options with a .922 save percentage 2.16 goals against average and 7-3-1 record. It’s going to be a match-up of two very good teams, but even if Washington doesn’t earn the win, Holtby has a history of making a high degree of quality and large quantity of saves. He has allowed two goals or fewer in eight of his 11 starts.